“Super-fans” are a group any business should be keen to target. By giving those extra-keen brand loyalists a chance to interact with each other as well as with the brand itself, groups create a powerful ecosystem in which members forge meaningful connections with your business. And those connections among customers and fans are more important than ever. The 2017 Edelman Trust Barometer shows that people are far more likely to trust someone like themselves (60 percent) for company information than they are the company CEO (37 percent). Read on to learn how to use Facebook groups to grow your business and engage your audience. A Facebook Page is essentially a Facebook profile for your business. As Facebook puts it, “Facebook Pages enable public figures, businesses, organizations and other entities to create an authentic and public presence on Facebook.” Only official brand representatives can create a Facebook Page for that business. Anyone can create a group, which means that even if you have not created a Facebook group yourself, there might already be a group related to your brand. 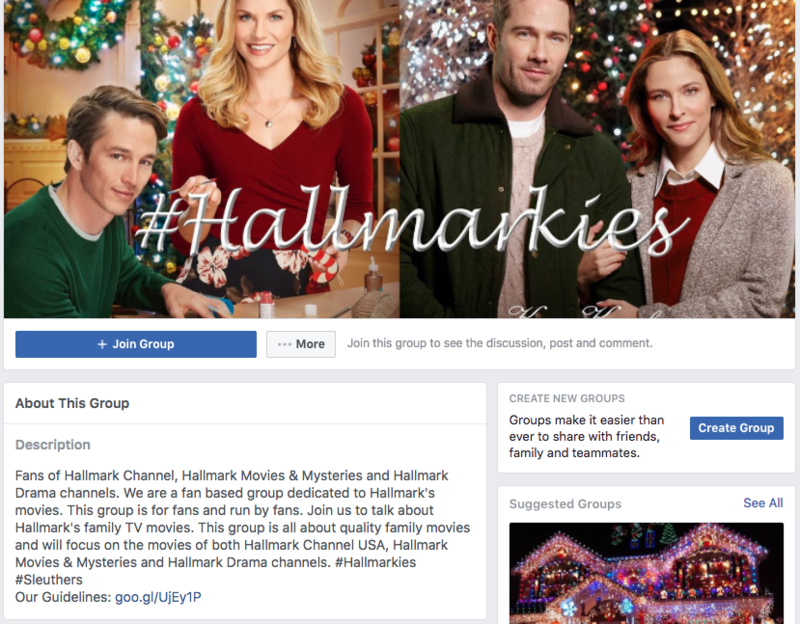 For example, fans of Hallmark movies created and manage the group called Fans of Hallmark Channel, Hallmark Movies & Mysteries and Hallmark Drama, which currently has more than 21,000 members. If groups related to your business already exist, you should definitely get involved to keep an eye on the conversation, learn from what people are saying about you, and help provide the brand’s perspective. You might even uncover some potential ideas for new product development. (We’ll get into more detail about finding and joining existing groups below.) But you should also create your own official group as the brand-endorsed meeting place for fans on Facebook, so that you can grow those relationships in a context that gives you greater control. The actual process of creating a Facebook group takes just a few clicks. The harder work is making decisions about the purpose of your group and how best to support it through the various options available. Here’s how to get started. 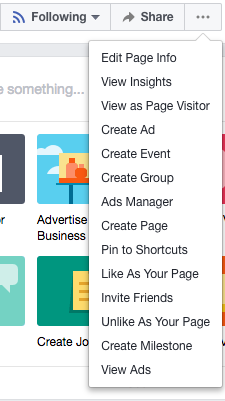 Log into your brand’s Facebook Page and click the more icon (…) at the far right of the menu bar under your cover photo, then choose Create group. You’ll want this to be something that’s easily recognizable as connected to your business and conveys what group members will get from the group that they can’t get by following your Facebook Page. Keep in mind that you can create multiple groups to cover different aspects of your business or different customer groups, so you don’t need to try to make your first group a catch-all. 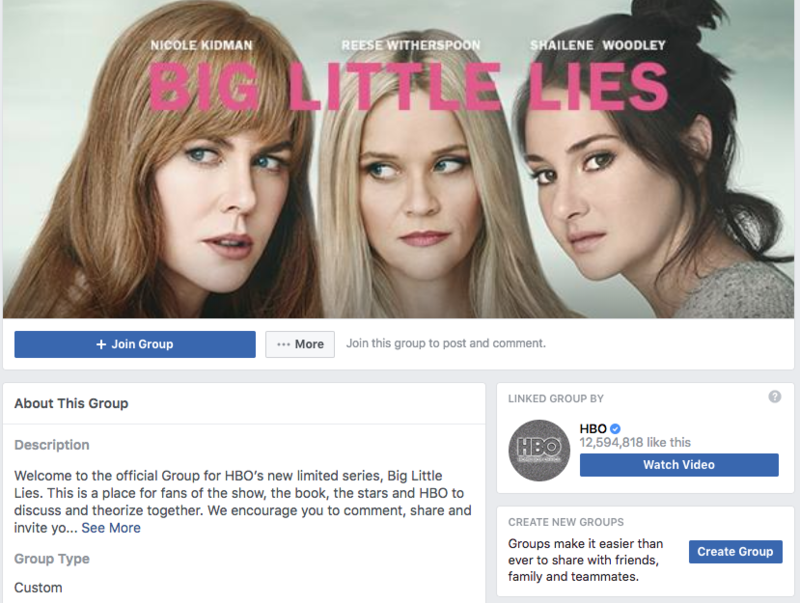 For example, HBO has a group specifically for fans of its Big Little Liars series. Just like no one wants to be first to arrive at a party, no one want to be the first person to join a Facebook group. Invite some colleagues, employees, or friends to get the ball rolling. You may also want to reach out to some of the more active participants on your Facebook Page and let them know you’re creating a group you’d love them to be a part of. You can choose to customize your invitation with a note—this is a good way to let people know why you are inviting them to the group, and how they can expect to benefit from participating. Click the paper icon in the bottom right corner of the invite box to add your note, which will go out to all invitees. You have three privacy options: public, closed, or secret. A public group is exactly what it sounds like. It’s fully visible to everyone, and anyone can join without being approved. All members’ posts are fully visible to all other Facebook users, so this type of group does not offer the sense of privacy and security that comes with the more restricted group types. However, it is the easiest group type for users to join, and can therefore grow quickly. In a closed group, posts are only visible to members, so there’s a sense of being involved in an exclusive community. 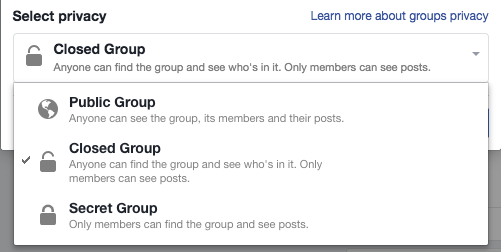 The group itself appears in Facebook searches, and the description and member list are visible to anyone on Facebook. It doesn’t offer complete privacy, but members can feel comfortable knowing that the posts they share are visible only to members of the group. All new membership requests must be approved by an existing member or administrator of the group. A secret group offers the same post privacy as a closed group, with an added level of stealth: the group does not show up in Facebook searches. The only way to find and join a secret group is to be invited by an existing member. There’s no right type of group for all businesses. If you want to encourage lots of public discussion, a public group might be your best bet. If your business deals with an area of life that people consider to be personal or private, you might want to consider a closed group so that people feel comfortable sharing thoughts that they might not want to be publicly visible. A secret group could even be a fit, if your goal is to offer a super-exclusive online meeting place—for premium members of your subscription site, for example. Once you’ve selected your privacy level, click Create. 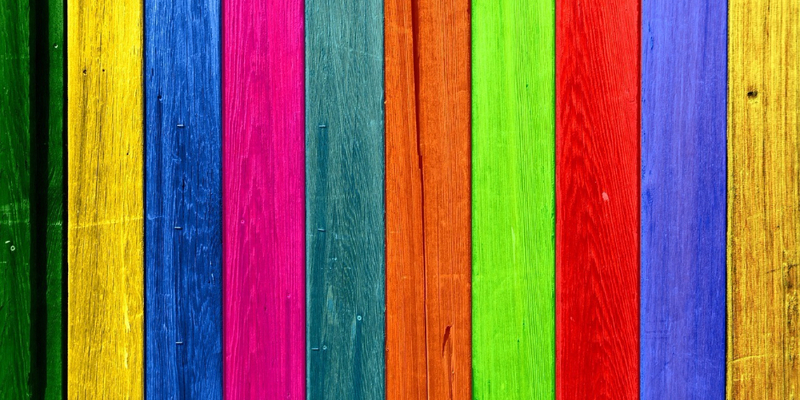 Add a cover photo: Choose something that highlights the unique purpose of this specific group, rather than a generic image for your business. And make sure you’re using the recommended image size dimensions. Add a description: Create a catchy explanation of what the group is all about. Remember that this information is publicly visible for public and closed groups. 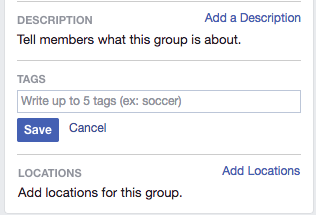 Add some tags: These tags function as keywords that will help your group appear in search. Get the discussion started with some posts of your own, and encourage your colleagues, employees, and friends to post as well. Once the discussion gets rolling, conversations will start to happen more organically. You may wish to pin a post to the top of the group to provide additional information that you don’t want to include in the public description (for example, rules for participation in the group). In addition to communicating with potential clients and customers, Facebook groups can be a great source of professional connections and networking opportunities. Getting to know fellow entrepreneurs in your local area or niche topic of expertise, for example, can help create growth opportunities for all group members. You can share information and ideas within a safe shared space, which can be particularly valuable if you work from home or within a small company. 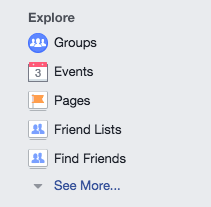 A simple Facebook search will help you uncover existing Facebook groups that are relevant to your business goals. The process of finding these groups is easy. The tougher part is deciding which types of groups will be most useful to your professional development and help you grow your business. If you join too many groups, you’ll be overwhelmed with posts and won’t be able to participate in regular discussions. Facebook allows you to join up to 6,000 groups, but this would be an impossible number of communities to keep up with, so it’s important to zero in on the groups that offer the most benefits. Here are three ways to find them. In the left column, under the Explore heading, click on Groups. If you’ve already joined some groups, you’ll see them listed on this page. Click on the Discover tab at the top of the page. Facebook will bring up some recommended groups based on Pages you’ve likes, your location, groups your friends belong to, and other clues from your activities on Facebook. You can also scroll through various topics and to find relevant groups for each subject. Once you find a group that looks interesting, click on the name of the group to view the publicly available information, or click Join to become a member of the group. Depending on the privacy settings, you may become a group member automatically, or you may have to wait for your membership request to be approved. Log into your Facebook profile. Enter a relevant keyword in the search box at the top left of the page. Click the Groups tab to see a list of groups related to your search term. As above, click on the name of the group to learn more, or click Join to become a member of the group. The thing about secret groups is, well, they’re secret. That means you can’t find them using either of the methods above. The only way to find and join a secret group is to be invited by an existing member. Talk to your contacts to learn whether they belong to any secret groups they might be willing to invite you to. When asking for an invite, be sure to mention ways you could bring value to the group, rather than simply seeking out benefits for yourself. The ways in which you use Facebook groups for business will vary depending on your industry, the size of your business, and your social networking goals. Let’s look at two examples of very different businesses using Facebook groups to build strong communities online. 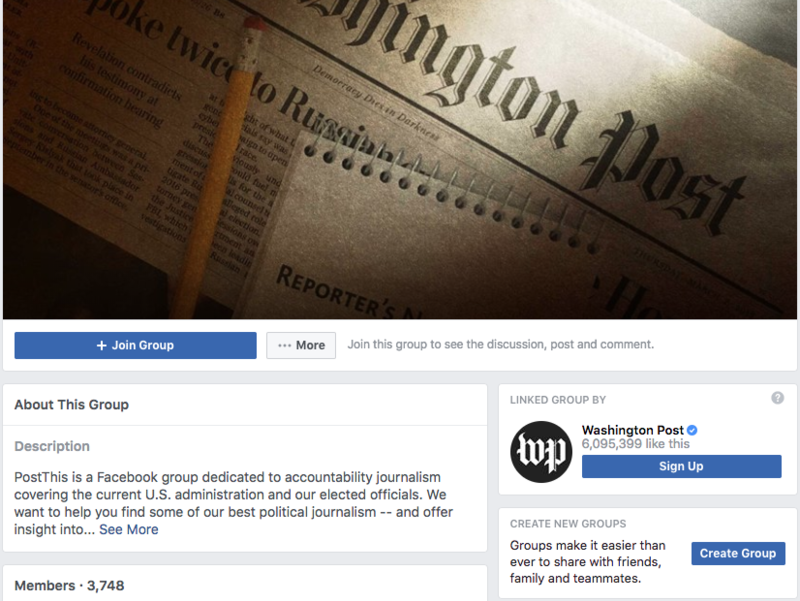 Facebook’s chief product officer, Chris Cox, cited the Washington Post’s wildly successful PostThis Facebook group as one of the motivations for launching groups for Pages. Two reporters from the Washington Post started the group from their personal profiles before it was possible for Pages to create their own groups. The goal of the group is to allow reporters to connect with the newspaper’s most dedicated readers, sharing information about how they do their work, where story ideas come from, and how the job of political reporting gets done. While the group has fewer than 4,000 members (compared to the more than six million followers of The Washington Post’s Facebook Page), it is very active, with multiple posts per day. Rather than simply Liking or commenting on stories, group members can engage in active discussions with the people who work in the Post’s newsroom, giving them an inside look at the work that goes into modern journalism. They can also connect with other readers, sharing opinions and information among themselves. In April of 2016, Shirley Weir of Menopause Chicks posted an online survey asking women what topics they wanted to learn more about. She had planned to use the answers to inform the content she would develop for her website, but when she learned that 70 percent of respondents said they didn’t have anyone to talk to about perimenopause or menopause (or that they would never talk about it with anyone), she decided it was high time to create a safe place for those discussions to happen. 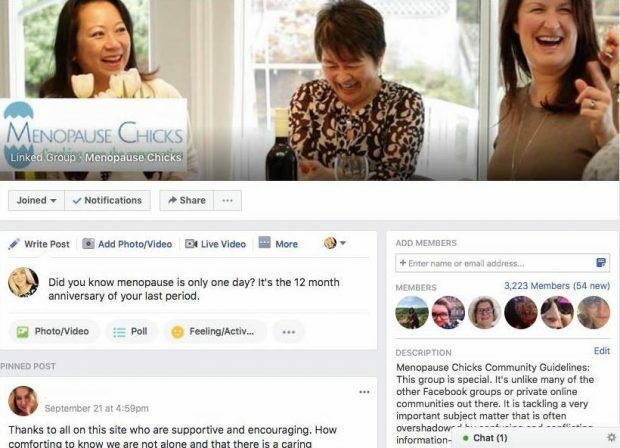 She launched her Menopause Chicks Private Community Facebook group that same week. More than 80 percent of the 3,500 members are active in any given month, and the conversations are personal, vulnerable, and highly valuable to those women who felt they had nowhere else to turn. Shirley gets involved in the conversations, highlighting her own value as an expert in her niche, delivering important information and resources to group members, and building her brand—all at the same time. Once your group reaches critical mass, it will take on a life of its own as members start conversations amongst themselves. But to get the most value from your group, it’s important for you to engage regularly with members, whether by starting conversations or jumping into ones that are already underway. One key benefit of having your own Facebook group is the opportunity to showcase your expertise and establish yourself as the go-to resource in your niche, so make sure you do so regularly. Respond to questions, ask follow-up questions of your own, and generally keep the conversations going. One easy way to engage and get new members involved is to post regular welcome messages. 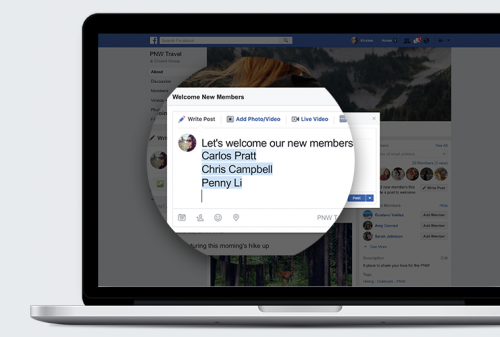 The built-in welcome message feature allows you to tag new members automatically, so you can introduce them to the group and let them know you’re happy they’ve joined. Most people who join your group will likely do so with good intentions. But there are always some spoilsports out there. And things can sometimes take a negative turn. It’s up to you or your designated moderators and administrators to maintain a positive atmosphere that’s welcoming and safe for all group members. Start by creating a clear code of conduct for your group and posting it in a prominent place (such as a pinned post) so that everyone understands what’s acceptable, and what’s not. You don’t need to get too draconian, but be sure to lay out your expectations in a way that everyone can understand. If things start to get heated within your group, you can use Facebook’s group administrator tools to temporarily black a member from posting or commenting, or permanently remove members who have violated your group’s rules. If one post in particular seems to be inspiring inappropriate comments, you can turn off commenting for that post, or delete it. If you have to remove a member, you can also choose to delete all of their past posts. Once your group reaches 250 members or more, you’ll gain access to Group Insights, which can provide information about which posts are most engaging, and what times create the best engagement among members. These analytics can help you refine your Facebook groups business strategy over time so you can focus on what works best. Since group members know they’re in a safe and regulated space, they may be more willing to share than they would be on other social media channels. Try asking your group members to share their favorite relevant content or give you feedback, and make sure to comment on and like what they share. You can also create and upload documents like text files and spreadsheets within a Facebook group. These can be a great resource for organizing information and keeping it in a consolidated, easy-to-find location. Facebook group documents are also helpful for collaboration on projects, brainstorming, or anything else, which can help establish your group as a place where ideas can flourish and connections can be made. Your Facebook group is essentially a focus group of your best customers and potential customers, so it can be an important source of valuable opinions and insight that can help you identify pain points, hone in on what your customers like best, and even come up with new product ideas. Use social listening techniques to get a sense of what matters most to group members. If you’re seeking specific information or opinions on one topic, try posting a poll within the group to measure responses numerically. Easily manage your Facebook presence using Hootsuite. From a single dashboard you can schedule posts, share video, engage with followers, and measure the impact of your efforts—all from the same platform that run your other social channels on. Try it free today.